Python Count method is used to count, How many number of times the sub string is repeated in a specified string. In this article we will show you, How to use Count() method to perform counting in Python Programming with example. Sub: This argument is required. Count method will look for this sub string inside the String_Value and if it finds then it will return the count value. Start: You can specify the starting value here. For example, if you want to count from middle of a string or at particular index, you can specify here. End: You can specify the end value here. For example, if you want to count up to middle of a string or up to particular index, you can specify here. The following set of examples will help you understand the count Function in Python Programming Language. Following statement will count the number of times ‘a’ is repeated in Str1 string and prints the output. Following python count statement will slice the string Str1 starting at 6 and up to 25. Within the sliced string, python will count the number of times ‘a’ is repeated and prints the output. Following statement will slice the string Str1 starting at 6 and up to End (In order to find the end value we used the python Len function). Within the sliced string, python will count the number of times ‘a’ is repeated and prints the output. 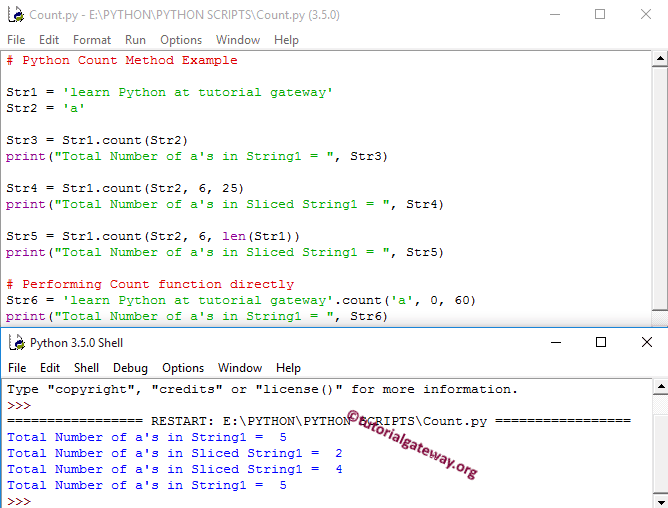 The following example is another alternative method to the String Count function in Python Programming Language.